It has been known for some time that exercise was more likely to benefit brain health and neuronal connectivity than sitting on a computer playing brain games. For more than a decade, authors such as John Ratey (a psychiatrist) alongside these authors have recognized that various growth factors are released by robust exercise, including BDNF and other brain-trophic chemistry (Simon is in fact a colleague in my faculty at UNSW in Sydney). Other conditions, such as chronic pain are now known to be classed as 'neuroplasticity gone wild' and we have known since 2011 and earlier that this was not only the case, but that mental illness, even in adolescence, was accompanied by cortical changes that were not in the right direction in these developing brains. Add to this the effect of being sedentary and adding 10 000 hours to the average school kid's sitting time before middle school has come and gone, and these and other modern life threats have been laid out in my own book, "Saving your life one day at a time: seven ways to survive the modern world" which I published n early 2013. 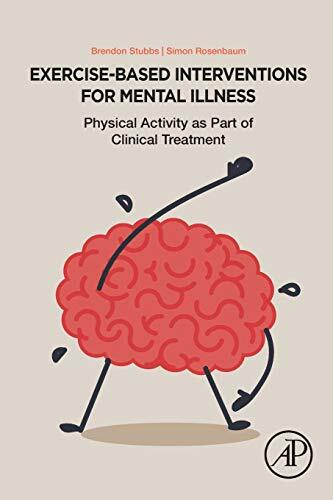 Cumulative evidence has therefore emerged over multiple years that exercise is not only good for you, it actually can act to rehabilitate brain and body following the onset of mental illness, and even may act as a resilient-building preservative. Studies of TaiChi and other meditative forms of exercise, or complex movement rather, have been shown to reduce the incidence of Alzheimer's and other dementias both sides of the Pacific. Working with the folks at United Health Group more than a decade ago, we found that principal care practitioners in the USA were far more likely to diagnose and treat mental illness with medication up front, whereas general practitioners in the UK were more likely to prescribe activity. Behavioural Activation, a part of 3rd-generation CBT is in fact likely to assist mood and include activities including those leading to better fitness and cognitive reserve. There is no surprise that Brendon and Simon were thus able to cover a gamut of the DSM in their chapters by inviting mostly UK-Europe based practitioners to submit their take on the subject. First up, predictably, are Meyer and Schuch on Depression, Herring on Anxiety and Stress, Vancampfort and Goldstein on Bipolar Disorder, Suitani and Vancampfort on Schizophrenia, Hallgren for Alcohol abuse, and then essential to this argument, Smith and colleagues on sedentary behaviour and mental health. Older people are always going to be a focus, so Chen and partners look at older patients with mental health issues, and on the flip side, Aussie gal Parker and Alan Bailey investigate the effects on adolescents and young people with mental illness. We all know that eating disorders are often associated with frenetic exercise, sport, ballet, and so Michel looks at this aspect of exercise-mental illness in eating disorders where this can be excessively used to control weight and appetite. We also know, from ourselves and everyone else that behavioural activation is not easy in normal and patients with mental health issues, and often this is the first thing that gets left behind as people lose motivation and the gumption to create self-volition in initiating or maintaining exercise and eating hygiene, and so Romain and Bernard tackle behavioural and psychological approaches to igniting interest in movement again. Stubbs and Rosenbaum then re-emerge to tackle forensic settings and Carney and Firth introduce the concept of mHealth as a method of increasing physical activity, with Stanton then introducing the methodology of integrating exercise professionals, as I do, into the multi-D treating team. There is the elephant in the room, dealt with by Rethorst, who looks at the mechanisms of action in these disorders, and suggests the need to go beyond the neurotransmitters and endocrine systems he mentions here, and how to scaffold the neurohumeral response. The editors re-emerge once more with Davy Vancampfort mentioned in a few chapters earlier, on research and evaluation in exercise and mental health, and interestingly in these chapters, the changes noted on neuropsychological testing are minimal compared to say, evaluation questionnaires or inventories which do show improvements. Finally, a chapter is devoted to Gorczynski and colleagues discussing various aspects of getting research into the field with a few case studies. So very exciting to start. One aspect I wondered about up front was that if exercise and the damage it does to the muscles in order to get lactic acid etc replaced by growth hormones, and these were added to the brain soup, how was the brain to know what to scaffold with this 'miracle-grow' for the neurons? Surely, as with say movement-meditative practices like ChiQong and TaiChi, some guidance is necessary to tell the brain what to do with these factors in order to effect change in the neuronal architecture? The editors note right up front that modern medication might have a role to play in depleting the health of patients, often producing metabolic syndromes and cardiac issues in the same way being sedentary does, and what I targeted in my own book in terms of the modern world. Satiety issues for instance in antipsychotics or dental caries in anticonvulsant are all side effects which create health issues for patients. Diabetes might accompany many medications, or loss of sexual drive with others. Every action of a drug usually disrupts some other function of the body or brain. The loss of life expectancy? Ignoring opioids for now, the answer is 15-20 years. In some cases, death by medication exceeds other causes in some countries. And we are slow to catch up. It takes 17 years to turn 14% of findings into applied clinical care. Woefully slow. As with medication efficacy studies, the heterogeneity of the term 'depression' makes studying the outcomes of exercise on Major Depression quite complex, especially in meta-analytical studies. Two things do emerge though: firstly, the intensity and duration of the exercise don't really matter, but certainly giving the person the right to decide what exercise they do and how long and how intensely they train, is critical to the outcome for them, in a personalized way. A menu of choices, in the Motivational Interviewing sense of the phrase, is key. Finding a way to specifically hone in on MDD is the task here. For instance, an overall improvement in fitness was NOT a necessary element in the treatment via exercise, compared to psychotherapy, so aerobic fitness elements might not be a critical element in the outcomes or necessary for reduction in symptoms. In this way, resistance training and a concomitant increase in strength likewise diminished symptoms in the same was a aerobic exercise did. Later studies designed to now compare to medication effects, found that all exercise was effect, but in terms of a bang for your buck, dose-response effect, more was better and that better outcomes attended greater frequency of exercise, and finally that this could augment treatment in patients resistant to medication or psychotherapy, even to remission rather than just symptom reduction. 3-5 sessions a week, 45-60mins, at 50-85% of maximum heart rate, and if we know the maximum weight we can lift, three sets of 8 repetitions at 80% of the max lift, would suffice, over 10 weeks of compliance. So clearly a few elements are at play. First of all, there is a slight increase in inflammation after exercise, to which the body responds by reducing inflammation, targeting perhaps this issue in depression. Balancing out neurotrophins has been mentioned above, and normalizing the HPA axis is also an element, as would be monoamines as referenced above. As Gordon Parker has noted (one of the editors works with his group), the heterogeneity of Major Depressive Disorder means drug companies have largely given up on new drug research, the DSM tells us nothing of what goes wrong and leads to depression, and so 1000 people in a room with depression would have come to it in different ways, so we need treatments with heterogenous actions: our first antidepressants were 'accidently dirty' as Stephen Stahls termed them, and worked well, with unfortunate side effects to their heterogenous actions on the brain and body. Finally, these authors will note that autonomy should be preserved and respected: barriers to increasing or resuming physical activity may depend on intrinsic motivation, and this is both unique to the individual and rooted in their values, many of which have been eroded in depression, as ACT based therapies have noted. I addressed these issues for PT's in my 2014 work, "Client-centered training: A trainer and coach's guide to motivating clients" which dealt with just this challenge. Matt Herring says much the same about anxiety, and gives us an excellent primer into anxiety disorders to start. Nine meta-analytic studies have supported the effects of exercise on anxiety in a positive way, with small to moderate effect sizes. Although we will hear about younger patients later in the book, Herring notes there is little evidence in this set of conditions, but a single bout of exercise knocks off ¼ to ½ a sd in this population. As with medication in depression, the worse your mood or anxiety is, the more the exercise is able to improve the symptoms, even after a single bout. This includes patients with other chronic illnesses comorbid. He discusses each form of anxiety disorder, and then the probably mechanisms of change, including placebo effect, GABA, Ne, 5-HT and so on. Again, the idea of motivational compliance vs adoption is a necessary key discussion. As with the neuroscience model I have promoted elsewhere, self-efficacy is a major issues, and predicts both adoption and adherence, as well as social support as a strong influence. Bipolar Disorder is one of the most catastrophic mental illnesses alongside Schizophrenia, and physical health issues account for a 10 year reduction in lifespan. They sit more in a day on average than older people. More needs to be done in investigating the benefits here. Schizophrenia likewise is a difficult disorder. The stats are similar to BAD above in that people who suffer in this way are remarkably inactive and sedentary. Positive, negative and cognitive symptoms all are improved by supervised professionally-guided exercise. Even if weight does not improve, fitness does, with apparent attendant benefits. Alcohol misuse is rife in my country and many others. New information is pointing out dangers beyond liver and brain disease, to now include cancer, and so excess mortality rates in this group are twice normal, and mental health impact gives them 1.5 times the risk of non-users. Intervention studies around exercise are cited and are compelling, despite the issue of users being demotivated to seek help in the first place, let alone comply with treatment. The elephant in the room so often here and anywhere today is the added risk to both body and brain of being sedentary, and increasingly so in younger groups. I note the recommended sitting time for kids and adolescents in Australia is so far exceeded by schools here that it would be laughable if it were not tragic, and adding homework and mobile time to it, it becomes too awful to contemplate. If there is an elephant in the room, he is sitting down and deconditioned, and likely to become mentally ill. If we consider the increase in insulin resistance this causes, the loss of muscle tone in the triple-flexed position, the added load on the neck by extending the head forward, doubling the torque every one inch of peering closer to the device, the release of inflammatory cytokines such as Interleukin 6 with the risks of depression and metabolic syndromes soaring, there is no wonder we need to intervene at regular intervals, not just at home time or before work sessions in the gym. In those who sat more, the rate is 25% higher than more active people. Worse, the association between depression and sedentary time is likely to be bi-directional. Add to this increased triglyceride levels the longer you sit, and we have a problem. The mortality rates in woman sitting less than 3 hours a day vs more than 6 are astonishing, and men are not immune: 11 hours in a car, 24 hours sitting overall, especially let's say in front of the TV instead of the computer, is deadly. The trick is that continuous sitting is the issue, and breaking this up, say by moving around for 3 mins in 60, helps a lot. Disappointingly, as I noted above, in older adults although there are great benefits, none is shown on formal neuropsychological assessment. Let us pause here. We know from Snowden's teaching nun's studies that even though these women had lesions that mimicked dementia to a high degree, they showed no signs of it clinically, or on neuropsych testing. The reasons here for this failure, which Chen and colleagues do not discuss, goes back to Parker as I mentioned above. The heterogeneity of the conditions and of the interventions needed. Snowden's group were teachers, nuns, homogenous in their eating, sleeping, education, sedentary, social support, spirituality, never married or bore children. As with the continuing studies into cholesterol, the same longitudinal studies point to a declining incidence of dementia with increased attention to education, socialization, movement, and care applied to managing blood sugar and heart health. One would expect that excluding brain training programs on computers, the multifactorial approach of exercise needs additional input to change cognitive status: use the BDNF by putting it to good use, studying Spanish or another language while combining this with scaffolding exercise, diet, socializing, moving more, eating clean, and managing your stress. Then, I believe, we will see gains in cognition when exercise is not standalone. Mention of the paucity of research in younger people is noted above, but here Parker (Alexandra, not Gordon) addresses this. She struggles to find advantages of treatment as usual over exercise, assuming TAU is more robust, but notes that the longer term advantage is at the hands of exercise. She finds this difficult to compute. However, having seen this, I have an idea why. The trial lasted 6 weeks. I have found exercise has its major advantage at 12 weeks as the BDNF and other hormones take their time to rebuild hippocampal and related connectedness over that time. Shock treatment likewise fades in value over about 3 months or so, as the brain adapts. So I found sustained effects of treatment would do something like psychotherapy beats medication in the long run, exercise beats both if sustained, which is often isn't, and a combination of the three gives us the best of all three worlds: Just Sayin'. In terms of self-efficacy, Prof Alex, I think both meds and CBT require some level of passive-active stance, but the self-efficacy gains in exercise, Motivational Interviewing, Self-Determination and ACT-values directed, seems to work better for me and my clients, and they continue to activate these behaviours long after seeing me for the last time. Again, that is my sample of a few thousand patients, elite military, athletes, corporates and others, not a research per se, but naturalistic. Parker's research is methodological, and she notes, there is not a lot of evidence otherwise, and the studies she reviews here in anxiety disorders are underpowered, and thus not giving us much evidence despite the direction. With substance misuse there are the inevitable dropouts, and with psychosis, something more promising. Frustratingly, once again, the research is not dealing with the heterogeneity of the conditions or multiple presentations, mimicking the failures of drug studies in these cases. The following chapter dealing with eating disorders deals with an even more complex set of scenarios, as here exercise can be excessive and used for a different purpose. The book continues on to deal with severe and complex issues, and I am gratified to see the field, especially psychiatry, robustly taking on the challenge of incorporating the body into its most obvious manifestation, the brain and attendant mind. Some wags have commented that Doctors leave medicine to enter psychiatry, and this may in some cases be close to the truth. On the other hand, regulatory bodies have taken political, almost guild-like views and for instance, censured an Orthopaedic Surgeon for recommending a patient go on diet to address diabetes. It is clear that a multi-D team is the best way to go, and rehabilitation companies need to address these issues rather than allow a siloed approach to treatment. An excellent anthology with multiple values to multiple readers and an essential read for all mental health professionals.